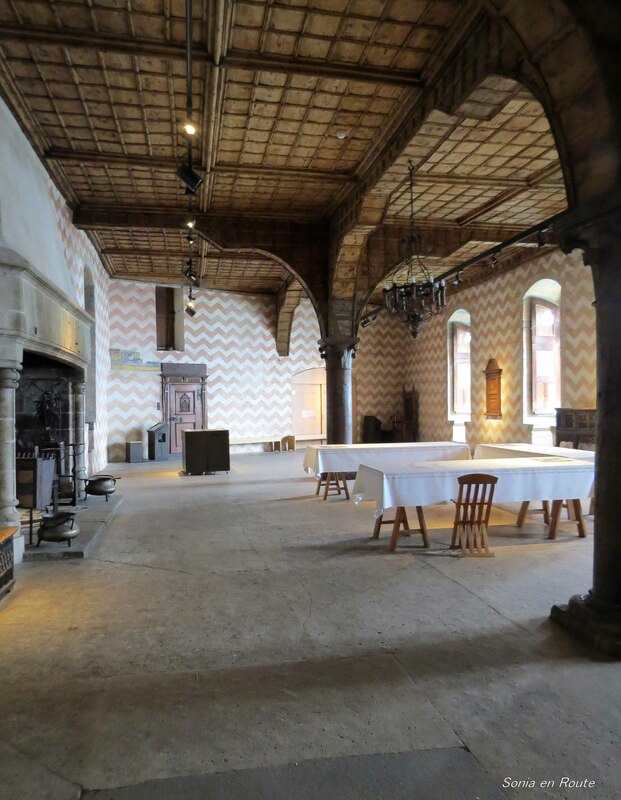 With over 40 rooms to visit, Chateau de Chillon has every room imaginable to present to us life in the Middle Ages. I shall not show you photographs from each one; that would, I fear, take away all the anticipation you may have in seeing for yourself all that the castle has to offer 🙂 But I will show you a few pictures from a few rooms. Not necessarily the most beautiful, but those that had some peronal meaning for me. The dining room possessed one of the biggest fire places that I have seen. Rightly so too, since a whole pig or a wild boar might have been roasting on its spit while the jolly company of guests rested at the huge wooden tables toasting the host or the succesful hunt with tankards of beer. At least that is what I imagined when I entered this room. I tried not to see modern tables and chairs that looked too small and insignificant in this huge room. The small bedroom felt cozy and snug, even though the walls were rough, the wooden floor without a carpet, and the window was rather small. And yet, even the wooden floor would be warm to the touch when the wood stove was hot. The window gave just enough light to iluminate this small chamber and make it feel pleasant. 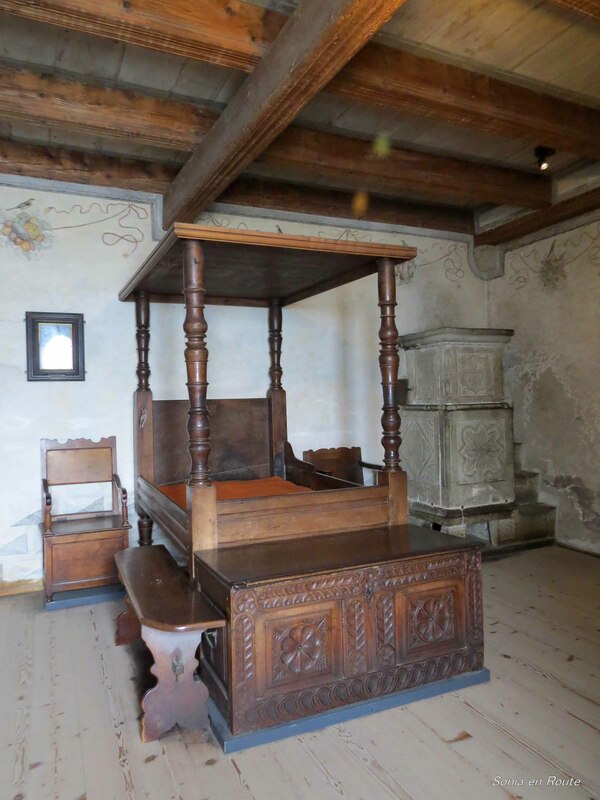 A nice room to rest, even by medieval standards, which is more the pity, because the person who slept there would probably be occupied in other rooms of the castle for the whole day and would not have time for leisure. The coat-of-arms hall was truly magnificent. 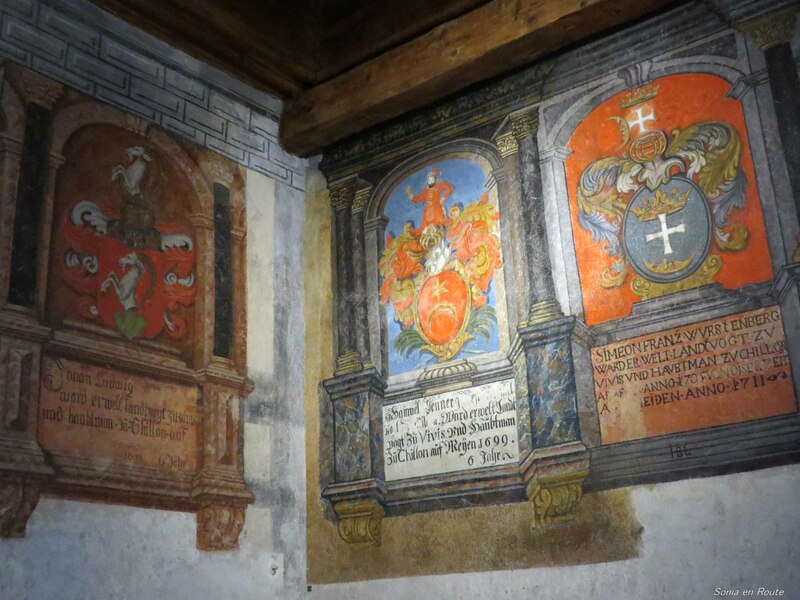 All walls around this room had coat-of-arms depicting the history of the owners of Chateau de Chillon. In the Middle Ages this was a reception hall and rightly so, for it spoke of the magnificence of the current ruler and his long and glorious past. 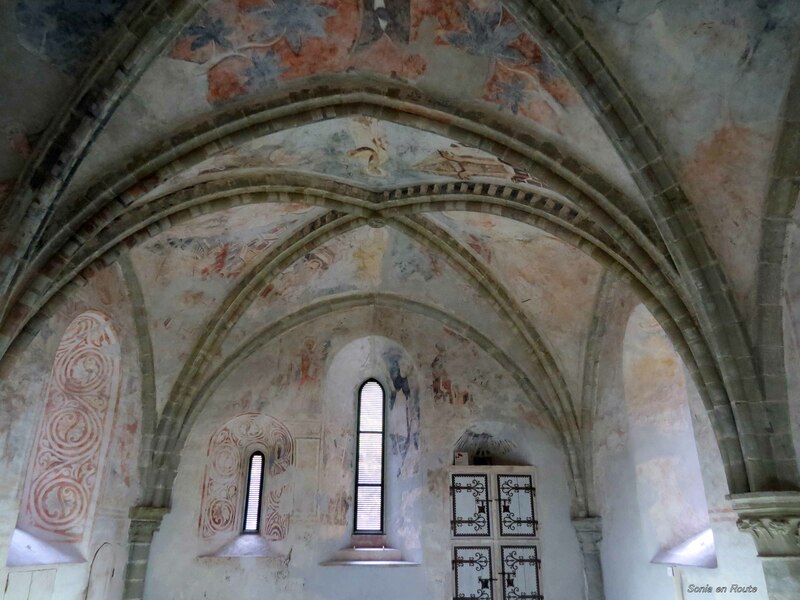 The chapel of Saint George was a private chapel of the counts and dukes that owned the castle. 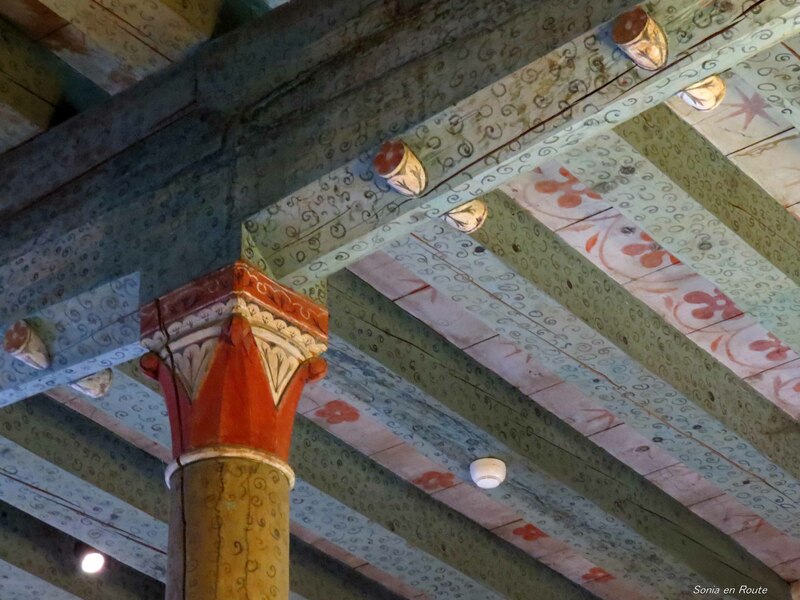 What remains of the frescoes and paintings on the walls has been restored. One can only imagine the beauty of this place as it was in the past. In the 19th century, when the castle became a prison, this was the place of worship for the prisoners. 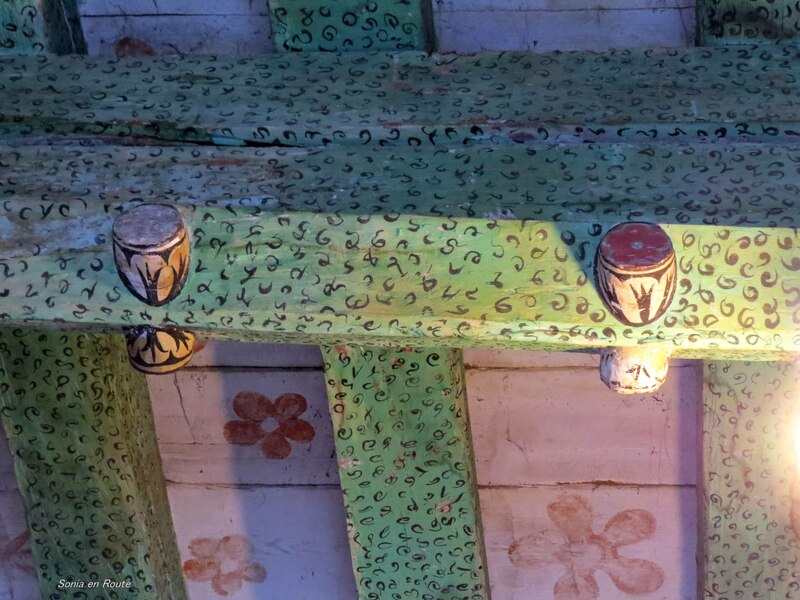 That wooden ceiling is stunning, I would have loved to do you company on this tour. Hmmm… that was a difficult one…got no idea. What a sweet thing to say, I would love it too. hi, did you reach the castle by public transport or did you join a tour? Well, we drove to the castle by car. I knew of this place; we have visited it some years back. There were tour buses there too. We drove from Basel, so I do not know about public transportation. But it is such a popular tourist attractions that there must be ways to get there. Love the painted wals, etc. Yes, they were great. The whole history of the people who owned, lived and loved there depicted on the walls. I remember how beautiful it was… Great photos, Sonia!